In this set you will find 30+ file folders all working on CLOTHING ACCESSORIES. 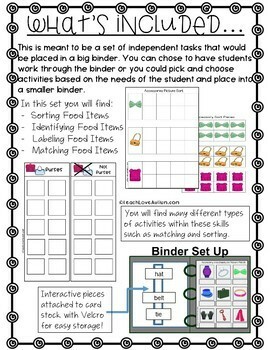 You will be able to have students complete sorting, matching, labeling, and categorizing the items. 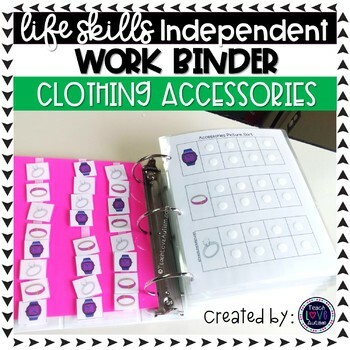 These tasks can be kept in binders, file folders, or loose for use inside work task boxes or used within an independent work system in a classroom. These materials are meant for use at a para-led station or an independent station depending on the students. This is part of a MEGA BUNDLE with over 600+ file folders on Time, Money, Measurement, Community, Household Items, Clothing and more! Check it out here!! 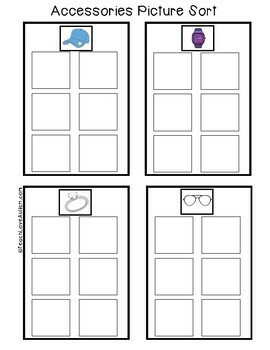 Follow me in many more ways to find out about new products and things happening in my classroom! *Go to your My Purchases page. Beside each purchase you'll see a Provide Feedback button. After selecting that button you will be taken to a page where you can give a rating and leave a comment for the product. I really appreciate your feedback as it helps me know what products are most helpful for your classroom!